“As we’re still a year away from its planned opening in Nashville, the National Museum of African American Music (NMAAM) made its presence known in a big way,” stated one of the NMAAM executives. The awardees included; Gap Band front man Charlie “Uncle Charlie” Wilson, Chic guitarist Nile Rodgers, gospel great Yolanda Adams, Nashville-based blues star Keb’ Mo’ and entertainment mogul Mona Scott-Young. The museum also assembled quite the lineup of artists to pay tribute to the honorees, including BeBe Winans, Tamia, Johnny Gill and Anthony Hamilton, who put a noted spin on Keb’ Mo’s “Am I Wrong.” Another one of the many show stopping performances was Avery Sunshine took the crowd to church with her tribute to Yolanda Adams blessing the audience with, “The Battle Is Not Yours”. Keb’ Mo’ was the first to make an acceptance speech, but he wasn’t the last to stress that recognition from NMAAM was a very special honor indeed. After a tribute that included a performance from Tweet and a video message from Missy Elliott, Scott-Young spoke about her longtime role as a music manager. Wilson even kept singing during his acceptance speech, breaking into “I’m Blessed” at the podium, with the house band backing him up. Surely the event and all who had a hand in pulling it together or attending it will share pleasant memories for some time to come. Mark and Diane Janbakhsh would visit the land on Nolensville Pike where the empty Elysian Field Kroger once operated and dream how to redevelop the property to benefit both the community and Nashville. After taking a leap of faith and purchasing the property, they defined their vision and began work to create a special place unlike anything else in Middle Tennessee. In May 2017, they opened Plaza Mariachi Music City, a mixed-use development designed to be a cultural and retail epicenter that celebrates Hispanic culture and history. The south Nashville location was a perfect site to build a family-friendly, retail and entertainment center because of the highly diverse population along Nolensville Pike. Living and working in the area are Kurdish, Salvadorian, Indian, Middle Eastern and Mexican families who comprise this diverse community. The Janbakhsh, owners of Plaza Mariachi, know first-hand how to market a culturally diverse development, it’s in their DNA. Mark, born to Iranian immigrants, grew up in Nashville and has been a very successful businessman and entrepreneur. Diane, whose parents are Hispanic, grew up in Mexico and Tennessee and used her talent in the design, art and music fields to help create a visually stunning Mexican marketplace. In 2010, Hispanics made up 10% of Nashville’s metro area population. Projections indicate that number will increase to 34% by 2040, making Nashville one of the fastest growing Hispanic cities in America. Plaza Mariachi was created to impact the local Latino community and to also educate non-Latinos. The owners view Plaza Mariachi as a place to celebrate all cultures and how they intertwine. During trips to Mexico, Diane and Mark were drawn to the architecture and the beauty they saw in streets, archways, doors, and windows. They incorporated these designs in the 70,000-square-foot space that now resembles a traditional Mexican marketplace. The transformation took over two years and more than 10 artisans to create the five calles (streets) named for Mexican revolutionary heroes and storefronts bearing Latino names. The opening of Plaza Mariachi created 200 new jobs for Nashville with positions in the restaurants, retail shops, service-based businesses, art gallery, dance studio, Maz Fresco -a fresh market grocery and other businesses. The Food Hall is Plaza Mariachi’s central meeting place and is open from morning to evening. The 300-seat space provides complimentary WiFi for those having breakfast, lunch or dinner….or just dropping in to listen to live music. For people looking for authentic cuisine, there are numerous menu options and price ranges from fine dining to a pop up cantina. All Latino communities are represented including Peruvian, Puerto Rican, Venezuelan and Nicaraguan. Currently, there are 10 vendors in the food court. For a list of all food vendors, visit www.PlazaMariachi.com. Music, dance, and art fill Plaza Mariachi on a daily basis. Musicians play from the state-of-the-art stage with LED lights in the Food Hall. Bands invite everyone to enjoy the dance floor. The most popular night is Thursday Salsa Night. Salsa lessons start at 7:30 p.m. followed by salsa music. For a list of singers and bands performing each week, visit www.PlazaMariachi.com. Children can learn about Hispanic culture through dance classes taught at the Baila Dance Studio. To learn more about dance classes for children and adults, go to www.hispanicfamilyfoundation.com. The Ceiba Art Gallery is a fine arts studio showcasing local and international talent. The showcased art connects people of different backgrounds. Weekend art projects are held for kids to expose them to different cultures in Latin America. For more information, visit www.ceibagallery.com. Shoppers can find a variety of options at the various retail shops located inside Plaza Mariachi. The HFF Gift Shop features artisan gifts from Mexico, Guatemala and Peru. Sales from the shop directly support the Hispanic Family Foundation, which is located at Plaza Mariachi. Browse the shops. You can count on finding unique items in all the stores. In addition to the retail shops, Plaza Mariachi is home to businesses designed to serve the Latino community. Businesses that provide help with purchasing cars, homes and insurance are located at Plaza Mariachi. In addition, companies that provide tax services and legal services for immigration, criminal and personal matters are available. Plaza Mariachi is located at 3955 Nolensville Pike in Nashville. Hours are Monday through Thursday, 10 a.m. to 9 p.m.; Friday and Saturday, 10 a.m. to 10 p.m.; Sunday, 10 a.m. to 8 p.m.
Directory Focuses on the Importance of Diversity in the Tennessee Business Community. Nashville, Tenn. – Publisher and CEO Tunisia Scott announces the release of the 27th Edition of her business directory the Tennessee Minority Pages (TMP). This year’s issue focuses on the unstoppable rise of the entrepreneurial spirit of minority populations. TMP continues to recognize the diverse communities throughout the region with a goal of building bridges into the invaluable services of minority businesses. Opening this edition is a profile of Dr. Min Wang, director of Wang Vision 3D Cataract and LASIK Center and world-renowned laser eye surgeon. Dr. Wang is also the co-founder of the Tennessee Immigrant and Minority Business Group, an organization that provides support to diverse cultural and ethnic companies. “Dr. Wang is a perfect example of what represents the businesses featured in the Tennessee Minority Pages,” said Scott. A spotlight on Beauty Queen Lashan Mathews Dixon. To download a free copy of the 27th Edition of the Tennessee Minority Pages visit www.tnminoritypages.com/27th-edition. To pick up a copy a list of distribution locations can be found at www.tnminoritypages.com/distribution-locations. The weekend which the Black Music Honors & Awards took place can be scaled down to one word – the word “WOW” is what initially comes to mind. The classy lady known as both Nashville and Music City USA. A live taping television special took place on Friday, August 18, 2017, at the Tennessee Performing Arts Center (TPAC) in Nashville, TN. Central City Productions will pay tribute to various high profiles, award-winning entertainers. They included: The Jacksons, Donnie McClurkin, Slick Rick, Guy, Oleta Adams and Jody Watley during the Black Music Honors. The two-hour event acknowledged the legendary African American artists who have influenced and made significant musical contributions to African American culture and American music worldwide. Rickey Smiley, television/radio personality and Grammy Award-winner and actress LeToya Luckett, will co-host the show set to air on broadcast syndication, Sept. 2-30, 2017 and on Bounce TV, Tuesday, October 10, at 7:00 p.m. (EDT). The legendary groups, The Jacksons graciously received the prestigious Lifetime Achievement in Music Award during the star-studded television taping. The Jacksons are still considered one of the hottest and most popular groups worldwide. The much-celebrated Jacksons made a remarkable performance debut at the event. Playing to a packed venue, the noted Jacksons performed some of their greatest hits, commanding an attentive audience to stand on their feet and cheer. Stellar Awards and Grammy® Award-winner Donnie McClurkin, received the Gospel Music Icon Award; the R&B group Guy (creators of the New Jack Swing sound) was given the R&B Soul Music Icon Award; Grammy® nominated rapper Slick Rick was presented with the Hip Hop/Rap Music Icon Award. Timeless beauty, Grammy® nominated-singer Oleta Adams proudly received the Legends Award. Another Grammy® Award-winner, Jody Watley was recognized with the Crossover Music Icon Award. The Black Music Honors list continued to light up the night with other noted music and entertainment icons and special performances. There were special performances by Avery Sunshine, Dave Hollister, Jonathan Butler, Karen Clark Sheard, Kid N Play, Latrice Crawford, Leela James, Marvin Winans, SWV, Da Brat, Sevyn Streeter and more. The Black Music Honors is produced by Central City Productions. Proceeds from the ticket sales will go to the National Museum of African American Music, scheduled to open in Nashville, TN, in 2019. The event took place in Nashville, TN at the Tennessee Performing Arts Center (TPAC) located at 505 Deaderick St., in Nashville. The doors opened at 6:00 p.m. and the shows taping kicked off at 7:00 p.m. (CDT) However, due to CCP working with various networks and industry partners, it will be seen worldwide. Check your local and other listings and stay connected with social media and the websites for this and future productions.Also be sure to like www.facebook.com/BlackMusicHonors. Chicago’s premier TV Production Company. With 46 years of successful and innovative television production and marketing experience, Central City Productions (CCP) is a leader in minority- targeted television. CCP is a full-service television production company that produces, syndicates, and manages advertising sales for all its programs. CCP programs reflect the widespread diversity of talent, the one-time specials and the annual and/or weekly programs that have achieved tremendous mass audience appeal, including its flagship production of The Stellar Gospel Music Awards. The Annual Delta Sigma Theta Inc Holiday Dance and gala was one of the most amazing events that Music City USA held in2016. On Saturday night, December 10th, thousands of Nashville’s prominent African- American entrepreneurs, leaders and socialites partied at the Municipal Auditorium for Delta Sigma Theta Sorority, Inc. Nashville Alumnae Chapter’s Annual Holiday Soiree. It was a night to remember and said to be one of the classiest ‘invitation only’ affairs held in the Mid-state. Delta Sigma Theta Sorority, Inc. is a group of women vested in culture, education, loyalty and the empowerment of our community worldwide for over 100 years. Over 50 tables were hosted by Chapter members who are some of Nashville’s most prestigious leaders. State Representative, Brenda Gilmore ,Judge Rachel L. Bell Property Assessor, Vivian Wilhoite, Senator Thelma Harper to name a few. Everyone in attendance was dressed to the nines and each table carried its own flair as the table host decorated their tables. They provided an array of tasty food and drink for their guests and no two were alike. It was almost magical to see the overall transformation of the venue. The difference between the usual concert or sports events held there to the tangible transpiration that took place for the Delta party was amazing. It was a “who’s who” memorable event and a few of those in attendance included; City Councilwoman at Large, Sharon Hurt, Publisher/Founder Tennessee Minority Pages- Tunishia Scott, Co-Founder and President of Campus RX- Dr. Dorsha James, Comedian T. C. Cope, and Vernon Winfrey, Media Mogul Oprah Winfrey’s dad, Dr. Stephanie Hale Walker and her husband Presiding Bishop Joseph W. Walker III and many more. There was even a photo booth complete with an array of photo props and various knick knacks designed to make the outcome of each photograph taken, even more memorable. Some of them were holiday themed and others were reflective of fun characteristics. One couple was overhead saying: “Man what a party, they thought of everything!” Party guests arrived as couples, with other friends or alone, but all by invitation only. Crimson and crème are the official Delta colors and whereas there was a great deal of red attire worn, others stuck to black and the range of colors and fashionably beautiful attire added to the overall tapestry. The packed house danced to the turn table skills of Victor Chatman (Victor Chatman Productions). This included many members of the National Pan-Hellenic Council and their guest alike. All in all it was an equally yoked combination of empowerment and delightful fun. If the plans for next year’s annual event are not already in the works, no doubt it soon will be. “The Delta Sigma Theta Christmas party is an annual event that kicks off the festive season with our family, friends and supporters”, said sorority member and attendee Beverly Walker Bell. The 47th Annual GMA DOVE Awards was so on point and almost electrifying. This year’s theme: ‘Love Amplified’ and as the seats and media room filled to capacity at the host venue; Lipscomb University Allen Arena, you could almost see the excitement building. There were so many valuable , working components including a bevy of pre-shows, showcases, concerts and VIP kick off receptions (as always) but the “day of the DOVES” will forever remain blessed and magical. Now organizers, talent, fans and everyone with an interest or passion with Christian, Gospel music, can sit back and enjoy the show – soon. Hosted by for KING & COUNTRY and Tye Tribbett, the 47th Annual GMA Dove Awards features performances by the biggest names in Christian and Gospel music, including Natalie Grant, Matthew West, The Isaacs, Anthony Brown, Tamela Mann, Hillsong UNITED and a special reunion performance by DC Talk. Presenters include Lecrae, Hillary Scott, Kirk Franklin, CeCe Winans, Lauren Daigle and more. WHAT: The GMA Dove Awards celebrate the contributions of artists from every style of Christian/Gospel music. Nominees are determined by over 1,600 professional members, and winners are voted on by the entire GMA membership of nearly 2,500. About the Trinity Broadcasting Network: With thirty global networks, the Trinity Broadcasting Family of Networks is the world’s largest faith-and-family television group, airing a broad range of church and ministry programming, Christian music, family-friendly movies, children’s programming, and shows for teens and young adults 24 hours a day to every inhabited continent via 82 satellite channels and thousands of television and cable affiliates. In addition, TBN’s most popular global networks are available on computers, smart phones, and other mobile devices and over 40,000 entertaining and inspirational On-Demand programs are accessible via TBN’s innovative online network, iTBN.org. To find out more about the Trinity Broadcasting Family of Networks, log on to www.tbn.org. Recently a new event Honored Music Legends in Music City through tribute and song The National Museum of African American Music (NMAAM) was pleased to celebrate six acclaimed honorees and a foundational music label on August 18, 2016. 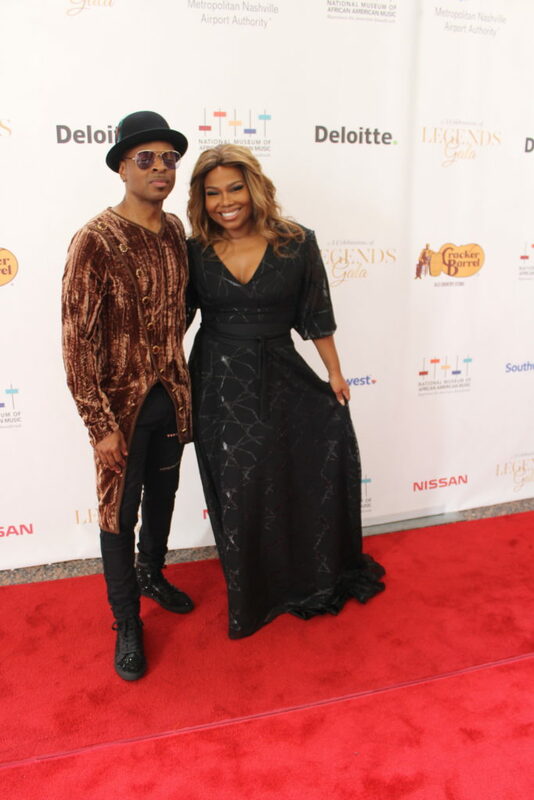 The night was filled with live, tribute performances featuring Grammy winning recording artists Eddie Levert, Tina Campbell, Ann Nesby, Deborah Cox, and Andra Day as well as Chubb Rock, Cherelle, Gerald Alston and Stokley Williams. Jekalyn Carr gave a dynamic performance that led up to Reverend Shirley Caesar being honored. Legendary, Grammy award winning groups, The Temptations Review featuring Dennis Edwards and The SOS Band also performed. Presenters included Kirk Franklin, “Big Jim” Wright, Monie Love, Kathy Sledge, Ethiopia Habtemariam and H. Beecher Hicks, III (president and CEO of NMAAM), along with several others. Nashville’s love for quality music and entertainment consistency has long since earned the vibrant city the title; “Music City USA.” The new brick and mortar museum forthcomin g to the city will proudly display a bevy of talent history. The Black Honors was a night to remember as the Tennessee Performing Arts Commission (TPAC) venue hosted a packed audience. More quality programming and upcoming events representing NMAAM are in the works. Make plans to visit NMAAM in Music City, in late 2018 when the physical doors open. The 2016 Summer NAMM show returned last week to Music City Center in Nashville, offering a robust platform for buyers, exhibitors and professionals to engage with the latest products, learn new business strategies and to connect with other industry peers. Also to position their businesses for a successful second half of the year and “Spotlight Tennessee” was on hand with full coverage. NAMM, the National Association of Music Merchants (NAMM), commonly called NAMM in reference to the organization’s popular NAMM trade shows, is the not-for-profit association that promotes the pleasures and benefits of making music and strengthens the $17 billion global music products industry..
With the wealth of educational sessions and leading manufacturers on hand, 14,055 industry professionals registered for Summer NAMM, a 1% increase over 2015 and 14% over 2014. Of that, international attendees accounted for 12% growth over 2015, and 59% growth since 2014, making for the largest number of international participants at Summer NAMM in over a decade. The number of buyers attending Summer NAMM was comparable in count to 2015, however the mix continues to evolve. This year’s event saw a small drop in community music stores but an increase in member buyers from Asia and Europe, combined with a strong turnout of mid-to-large U.S. dealers, which populated the show floor with buying power. The show counted a variety of new and returning exhibitors including Dunlop, Ernie Ball, Fender, Ovation, and Pearl, among many others, and with Summer NAMM veterans like Martin, Peavey, Roland, Sabian, Taylor, Yamaha, and Zildjian returning to showcase their latest gear. This year’s show saw a rise in exhibitors with 1,650 brands represented by 517 exhibitors, an increase of 5% over 2015. Professional education was a strong draw for many, as NAMM U and TEC Tracks offered 54 sessions that covered a variety of business-enhancing topics, all in an effort to position attendees for success. “This is my thirty-fifth year in business, and most of my total education on retailing has come from NAMM through NAMM U. It has been great for me,” said David Schmidt, of Schmidt’s Music in Pensacola, Florida. The show opened on Thursday with a NAMM U breakfast session, The Online Retail Summit, where retailers who have made a place in online retailing relayed to the crowd their lessons learned, best practices and tips for success. On the floor of the show, the Music City Center was abuzz with a variety of new product debuts, business meetings and orders. Throughout the day, members enjoyed the NAMM Nissan Terrace Stage which featured a variety of performers. The day’s events were capped with a high-spirited performance from the legendary Charlie Daniels Band as part of the first ever, NAMM at Night opening party. On Friday morning, the show opened with a “no holds barred” breakfast session with NAMM U veteran speaker, Jeffrey Hayzlett. Hayzlett energized the morning crowd with his candid assessment of businesses that succeed and businesses that fail. Friday evening was capped with the Top 100 Dealer awards. Now in their sixth year, the Top 100 applaud excellence and innovation in music products retailing and this, year recognized Contemporary Music Center with the prestigious Dealer of the Year award. The event was hosted by Country Music Television personality Cody Alan, complete with live band, Tim Akers and The Smoking Session.